Sorry, no review of Gunstar Super Heroes yet. 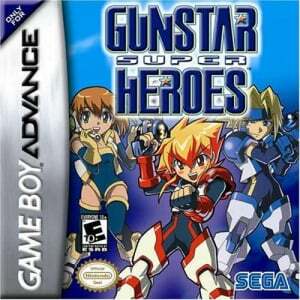 Gunstar Super Heroes is the sequel to the classic Genesis game Gunstar Heroes. You can play as Red or Blue as you battle through six levels, employing one of three different weapon types. Each character has a slightly different story and balance, adding variety to the 2D platformer gameplay. Gunstar Super Heroes features large bosses and pseudo-3D effects that maximize the graphics capabilities of the Game Boy Advance.